Beginning at age nineteen, Ralph Greenleaf won the world’s championship in pocket billiards nineteen times between 1919 and 1937. Known as “The Showman” because of his debonair style, Greenleaf brought the game out of shady billiard parlours to the mainstream world of sports and became nearly as well known as Babe Ruth and other legendary sportsmen of his day. Besides cleaning up at pool championships, Greenleaf was paid an exorbitant $2,000 a week to show off his amazing tricks in vaudeville houses. Greenleaf is still considered one of the best pool players of all time. He was also a notorious alcoholic who played and won many tournaments under the influence. He competed into the 1940s but by then was a heavy drug user and died a poor and broken man in 1950. His grave lay unmarked until some folks in the billiards scene mobilized to get a proper tombstone for him and his wife Amelia (a vaudeville star in her own right) in the 1980s. 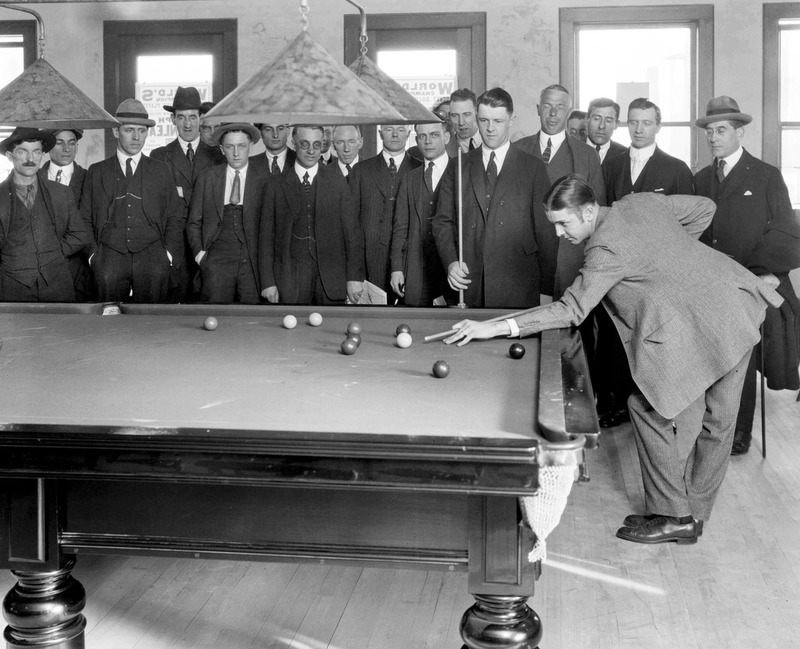 I haven’t found the context for this photo of Greenleaf in Vancouver, but it shows him in his prime, commanding the attention of some serious-looking billiards enthusiasts.